After your veterinarian has examined your dog, he or she may want to begin to collect more information that will lead to a diagnosis and then, a treatment plan. X-rays are usually the first line of imaging. The x-ray may lead to a diagnosis which allows them to move forward with a plan. However, sometimes the next step may be an ultrasound to get a more thorough or specific look at a particular area of the body. For instance, if your dog is vomiting and feeling ill, your veterinarian may take an x-ray to look for possible causes such as obstruction of intestines or an obvious foreign body. The x-ray may show some signs of an intestinal obstruction; however, before proceeding to surgery, it would be prudent in some cases to follow with an abdominal ultrasound. The ultrasound will give more detail of the questionable area and therefore allow more confidence in the treatment plan to move forward with surgery. Occasionally, x-rays and ultrasound allow for a definitive diagnosis, but other times they will simply add more information to help put the puzzle together for the best treatment plan for your dog. In modern scanning systems like the ones Creekside Animal Hospital has on-site and uses on our canine patients, the sound beam sweeps through the body many times per second. This produces a dynamic, real-time image that changes as the dog ultrasound device moves across a dog's body. We can use the results of an ultrasound to determine what is ailing your dog and to devise the most effective treatment protocol. Common symptoms that may cause a veterinary to use ultrasound include vomiting, weight loss, kidney impairment or blockage and heart disease. A dog MRI is not used as regularly as an x-ray or ultrasound because the equipment is very expensive, very large, and requires specially trained technicians to operate. However, Creekside Animal Hospital offers comprehensive dog MRI services because we believe that facilitating complete canine care means having all the tools and training necessary to do so. CT scans for dogs, also known as 'cat scans', are computer enhanced dog x-ray procedures most often used to evaluate complex parts of the body, such as the head, chest, some joints, and various internal organs. CT scans show different levels of tissue density and produce more detailed images than x-rays. Unlike MRI's, CT scans for dogs do not use magnetic field waves so they cannot compare changes in fluid levels due to inflammation or bleeding. Therefore, CT scans for dogs are used in situations where an MRI is considered unnecessary, but a traditional x-ray is inconclusive or insufficient. 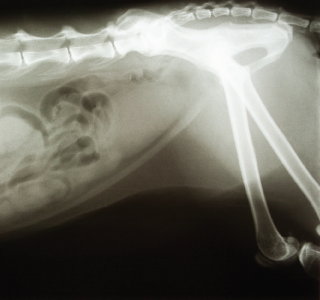 The goal of canine radiographs is to ascertain a diagnosis or obtain a final answer without having to perform further, more invasive tests or procedures. For example, an x-ray might show some soft tissue swelling in the knee, but the addition of an MRI would reveal the specific tendon or ligament tear that is causing a dog to limp and allow for a more specific treatment plan, diagnosis and prognosis.